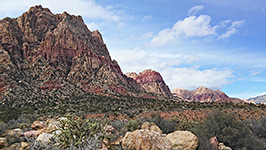 At 1.9 miles, the First Creek Trail is one of the shorter paths in Red Rock Canyon National Conservation Area, ascending gently across a wide desert plain to an overgrown corridor along a streambed. 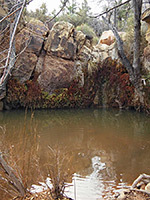 At some times the stream may be completely dry but it usually has a light flow, and the main point of interest on the trail (after 1.1 miles) is a pretty pool below a seasonal waterfall - a peaceful place where the creek falls four feet down a fern-covered wall of conglomerate, enclosed by higher rocks on each side. Past the falls, the trail continues 0.8 miles to the edge of the Spring Mountains, as the creek emerges from a typically overgrown, boulder-filled canyon, and it is relatively easy to scramble up another half mile or so. Most of the hike to the waterfall is through scattered vegetation of Joshua trees, creosote bushes, banana yucca and cholla cacti, becoming more overgrown only towards the end, as the path descends to the creek. 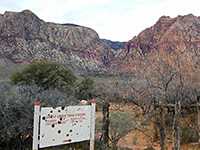 The First Creek trailhead is beside the main road through the park, just north of the turn off for Spring Mountain Ranch State Park. 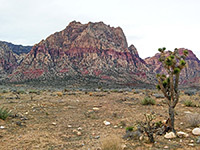 To the east, Joshua tree-covered land rises steadily to the flat summit of Blue Diamond Hill, while the western aspect is dominated by the Spring Mountains, 2 miles away, split by several deep ravines; First Creek is the closest. 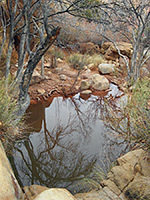 The trail starts by crossing the usually dry drainage of Oak Creek, of which First Creek is a tributary, then passes through a barren area, burnt in a recent wildfire and so lacking any large plants. This section of the path is lined by a cable fence to discourage people from walking on the damaged section and so helping the vegetation to recover. 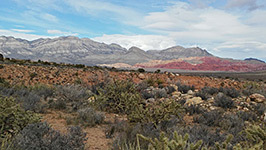 The burn extends for a third of a mile, replaced by a healthy mix of older Mojave Desert plants, and the path soon reaches a junction with the Valley Trail, a north-south route linking with the state park to the south and the Oak Creek Trail to the north. The First Creek Trail veers briefly south then moves back west, approaching the bushy streamway. 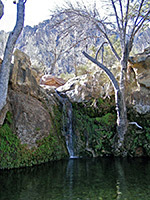 Shortly before an isolated pinyon pine tree on the south side of the path, an unsigned spur forks off northwest towards another prominent pine, meeting the creek just below the falls, which is the destination for most hikers. Cottonwood and willow trees provide plenty of shade, and ideal habitat for treefrogs. The main path stays a little way from the creek for another quarter of a mile before moving alongside the streamway, splitting into several routes which soon fade away as the mouth of the canyon approaches.